Compare at $28075 - Our Price is just $26995! Supportive seats and a quiet cabin make this Nissan Titan practical and comfortable for cruising the highway or the job site. 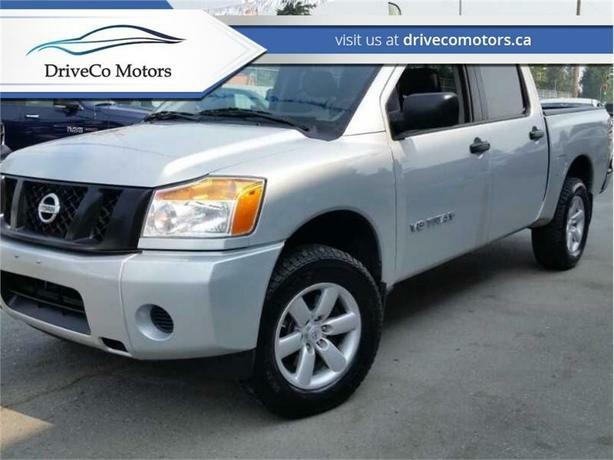 This 2015 Nissan Titan is for sale today in Coquitlam. Ready to expand your horizons? It's easy in this Nissan Titan. Put your foot down on a powerful engine that hits the road with impressive towing capacity. Underneath, a fully boxed ladder frame handles just about any job on the list while the cabin and bed give you plenty of room. No matter how epic your plans, this Nissan Titan is ready. This crew cab 4X4 pickup has 63111 kms. It's silver in colour. It has a 5 speed auto transmission and is powered by a 317HP 5.6L 8 Cylinder Engine. It has some remaining factory warranty for added peace of mind.